Register to Win a Silver Fork Winery Gift Basket at the Grand Opening! We will be drawing a special name that day for a Gift Basket that will include a bottle of wine and delicious goodies from each of our food vendors. Note: Jenn will be more prepared for photo ops in the future! 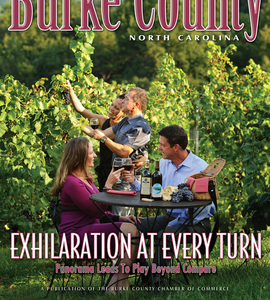 We are thrilled they asked us and our beautiful vineyard to be on the cover!!! On Jan. 30, 2013 we gave a presentation to the Rotary Club of Morganton that updated the 70+ members about the progress of Silver Fork Winery and our Tasting Room. 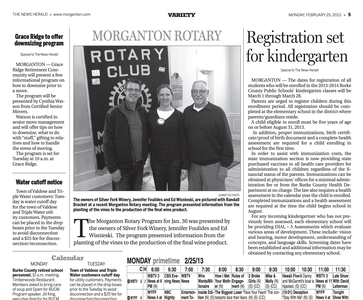 In late December 2012 the Morganton News Herald published a fine article written by reporter Mary Elizabeth Robertson that focused on the growth of the local wine industry and its positive impact on tourism. We will be posting events and news here and will have the Silver Fork Winery Shopping page where you can buy your favorite bottles and have them shipped directly.